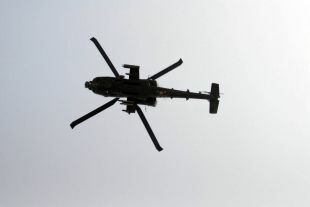 An AH-64D Apache with Company C, 1st Attack Reconnaissance Battalion, 1st Aviation Regiment, Task Force 12, glides effortlessly over Memorial Hall during the Memorial Day ceremony held at Contingency Operating Base Adder, Iraq, on May 31. Photo via the US Army by Sgt. 1st Class Christopher Dehart.